Do you want a tea kettle with all the bells and whistles? Whistling tea kettles are a common variety of the stove top tea kettle and whistles are sometimes found in electric tea kettles as well. The kettle's whistle serves as an alert - for safety reasons and convenience - indicating that the water inside has reached its boiling point and is ready for use. The whistle is a great safety feature. It happens to everyone at some point: You leave something unattended in the kitchen, get distracted, and forget about it. 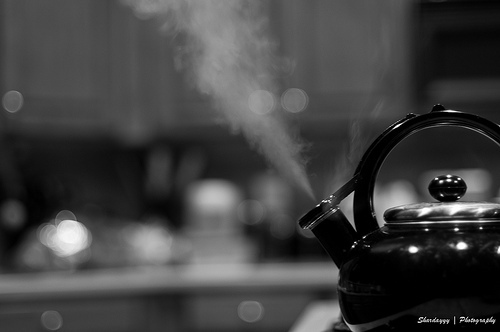 When a stove top tea kettle is left unchecked, the water boils until it has all evaporated. The kettle, having no water to transfer the heat to, becomes very hot, possibly melting or breaking and becoming a fire hazard. The whistle is like an alarm so you don't forget about your water boiling on the stove. Stove top whistling kettles are the most common of the whistling variety. The majority of stove top kettles have whistles. Electric whistling kettles do exist but they are less common because these kettles usually have an automatic shut-off feature that will prevent the water from boiling dry.